Microsoft is always working to improve its Surface devices, and a new patent filed by the company indicates that one possible avenue is developing a smart battery that's capable of being wirelessly charged in super-quick time. The patent, published last week and spotted by Windows Latest, describes innovative ‘smart batteries for ultrafast charging’ aimed at portable computing devices, so that could mean not just laptops or hybrids, like the firm’s Surface offerings, but potentially smartphones too (indeed a phone is pictured in the patent’s accompanying diagrams). However, it’s obviously likely that the main focus will be the Surface range, and the basic idea of the tech is to utilize multiple battery modules within the power pack, rather than just the one. These multiple modules could be juiced up with a more efficient wireless charging process via a battery management controller, with the net result being much faster charging. And that would certainly be great news for Surface users, who've suffered in the past on the battery front, with a number of gremlins plaguing Microsoft’s hybrids down the years. Of course, that’s assuming this charging technology is targeted at these devices, and that it ever makes it further than the research labs. There are plenty of patents filed rather speculatively, or which don’t make it past early prototypes, so it's far from certain that we'll see some kind of ultrafast charging introduced by Microsoft. We can but hope, though. It's also the case that products go through all sorts of changes during the development process. 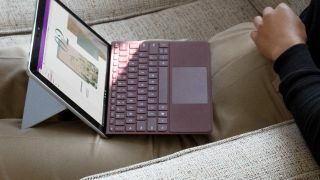 Indeed, we heard last week that the Surface Go, the newest member of Microsoft’s range, was originally supposed to be powered by an ARM processor, rather than the Intel Pentium Gold CPU that ended up inside the compact tablet.